The entire article up to this point seems to be designed to discredit the old story – but then, at best, it moderates it, so say yes, he had early news, early enough to buy shares, but he probably didn’t make much money out of it. What I find fascinating is that this story is always portrayed as anti-Semitic. While I don’t doubt at all that anti-Semitism was rife during the 19th century, there were plenty of reasons for people to hate the Rothschilds that had nothing to do with them being Jewish. For a start, Nathan had almost single-handedly financed the unjust British war effort against Napoleon. How many hundreds of thousands of deaths, how many destroyed homes and towns, were the result of his money? A New Napoleon Podcast Is Online! After a break of 3.5 years, WE’RE BACK, BABY! 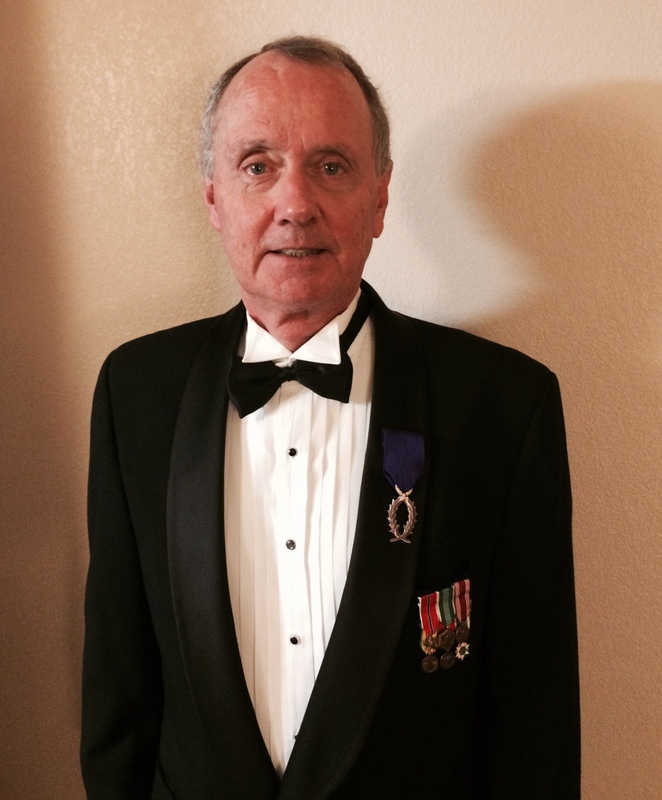 Sir J. David Markham – yes, he’s an actual KNIGHT now (see photo below) – and Cameron Reilly are back with a brand new episode. And what brought the show out of retirement, we hear you ask? The wonderful new 800-page biography by Andrew Roberts “Napoleon The Great”, we reply. Andrew joined us from NYC to explain how he manages to both be British *and* a fan of Napoleon; why Napoleon was a funny dude who cracked jokes even while on the battlefield; why Napoleon wasn’t the evil warmonger he’s often portrayed as by the British; why his marriage to Josephine wasn’t Romeo & Juliette; and what his biggest mistake was. Andrew’s book has recently been awarded the Grand Prix prize by the Fondation Napoleon and as of this Saturday will be listed in the NY Times bestseller lists (which, as you can probably guess, doesn’t happen with Napoleonic books very often). If you want to listen to the interview, you’ll need to be a premium subscriber. You can find the details about how to do that here. Napoleon Book Partly Basis For Book Of Mormon? A couple of Canadian whizzkids recently released the results of a breakthrough textual analysis they did on The Book Of Mormon and highlighted the books they believe LDS founder Joseph Smith used as inspiration when he wrote the book (Mormons, of course, believed he magically translated it from hieroglyphics on ancient golden plates, left by ancient Jews who arrived in North America before the Native Americans, using two magic stones… but that’s another story). Now this is fascinating news in its own right. But what’s even more of interest to us is that one of the books they claimed he used was a book written in 1809 about Napoleon! It’s a book I confess I’ve never heard of before – “The First Book of Napoleon, the Tyrant of the Earth: Written in the 5813th Year of the World” by Modeste Gruau who, it seems from the little information I’ve been able to find out about him, was only fourteen years old when he wrote it. According to this Wikipedia page (translated from the French by Google), Modeste Gruau de La Barre, born in La Chartre-sur-le-Loir on 25 March 1795, is known for being loyal to Karl-Wilhelm Naundorff, a Prussian watchmaker, who claimed to be the real Louis XVII . Anyway, back to the book. 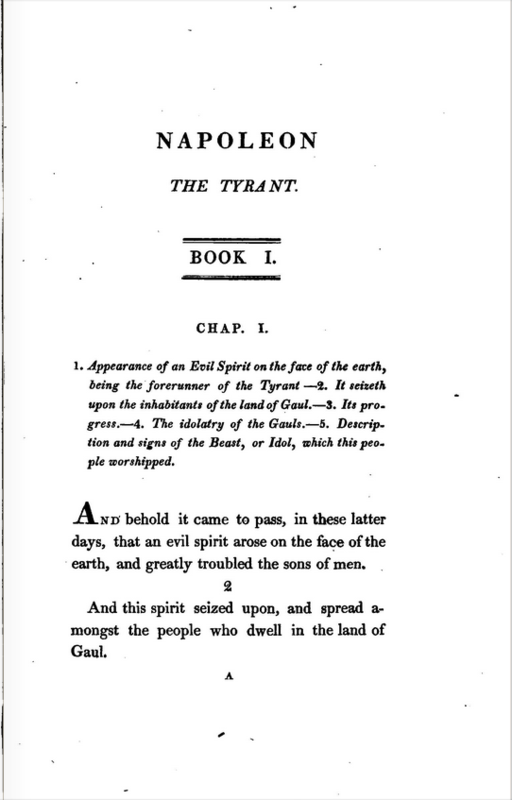 It is written in the style of the King James Bible and tells the story of “the Tyrant Napoleon” in dramatic style. You can read the whole thing, thanks to Archive.org and Google Books, but here’s the opening verse. Anyone who is familiar with The Book Of Mormon (I’m married to an ex-mo and have spent lots of time in Utah) will recognise the style immediately. Has anyone heard about this book or its author before? Can anyone shed light on who he was and how he managed to write this thing at 14 years of age? 200 years ago, in October 1813, Napoleon lead his dwindling army into The Battle Of Leipzig. The war gamers are re-enacting it this weekend – in front of nearly 30,000 spectators, some 6,000 history buffs from across Europe will act out the battles of October 1813, which were among the bloodiest of the 19th century. Read more. If you want more background on the battle, we discussed it in Episode #28. Even though Napoleon technically won, it was far from being a decisive victory. Napoleon afterwards went on to occupy Moskou, but eventually had to retreat. This “strategic withdrawal“, as David Markham and Cameron Reilly called it in their Napoleon Bonaparte podcast, was in fact a complete disaster, resulting in the “Grande Armee” being decimated. On his way back, the troops had to pass the battlefield they had left only a few weeks earlier, and hardly any corpses had been buried. You can imagine the effect this had on the moral of the French troops and their allies. Well it WAS a strategic withdrawal. It’s certainly not like the Russians came even close to winning a battle, let alone the war. Napoleon and his troops just decided enough was enough and it was time to return home. I don’t know what else you’d call it. 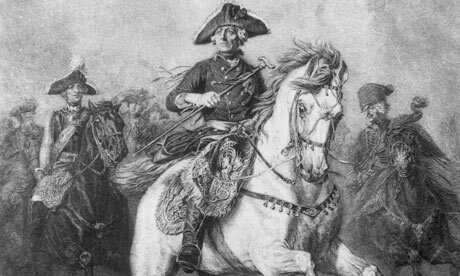 I was reading about Frederick The Great of Prussia last night when I came across this picture. I thought… hmmmm… that hat looks familiar! I don’t think I’ve ever heard this story before. Perhaps David or someone can shed some light on its veracity? 1000 Likes = New Show! Okay folks, to celebrate Napoleon’s birthday, I’m going to make you a promise – when the Napoleon Bonaparte Podcast Facebook page gets to 1000 likes, I will hold JDM down and FORCE him to record a new episode with me! Do we have a deal?? Now I know there are a lot more than 1000 of you out there who listen (or have listened) to the show, and yet our Facebook page only has 247 likes as of today. So…. get to it if you want to hear JDM’s sonorous tones in your microphone one more time! Click below to like the show! To celebrate Napoleon’s 243rd birthday (August 15), I thought I’d bring you some of my favourite quotes from the man. Feel free to share yours in the comments section!